Prayers for a good harvest set the stage for Yonabaru Town's traditional Tug of War Sunday, as thousands gather for a festival. 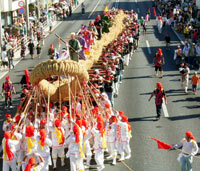 The 25th annual Yonabaru Festival has evolved from more than 400 years of inherited traditions, where residents called upon the gods to provide a bountiful crops harvest and to chase devils away. This year’s tug of war takes place in Yonabaru Town Sunday, beginning at 6 p.m. following a parade at 4 p.m. The Yonabaru Festival is a two-day affair, opening at 3 p.m. Saturday, and featuring the Yonabaru Junior High School brass band, children’s sumo competition, a larger scale adult sumo wrestling event, and of course, eisa dancing. On stage, children’s taiko drum presentations begin at 4 p.m., followed by live musical entertainment at 6 p.m., a taiko drum performance at 7 p.m., break dancing at 7:30 p.m., and So-Bo live at 8:20 p.m.
A children’s tug of war gets things going 9 a.m. to noon Sunday, followed by children’s eisa in the afternoon and adult presentations in the evening. Throughout the festival there are dozens of vendor booths offering food, fun and products for sale. Fireworks cap the evening at 8:45 p.m. The Yonabaru Fighter 3-show takes place on stage at 6:30 p.m., and JJ’s Blue Moon live music show at 7:45 p.m.
It’s the tug of war that draws like a magnet though. The festive event follows the historical precedent, with east and west villagers, both male and female, coming together. In olden days, men of the villages gathered and carried the rope around the community before the tug of war. All who attended the tug of war were assured of a safe life, free of accidents and injury from natural disasters.